Reverse Garbage Outdoor Sale – this Sunday! 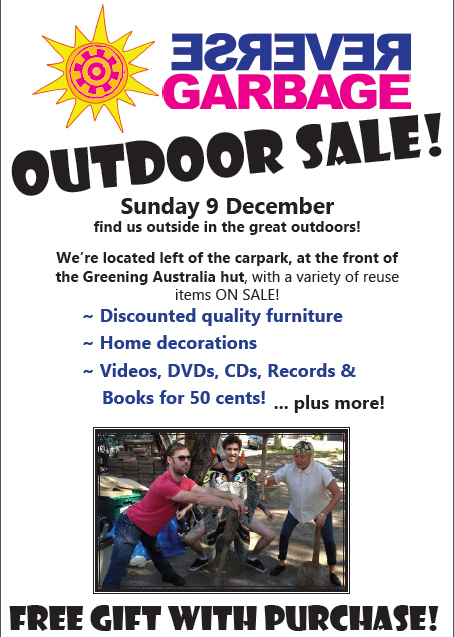 This Sunday 9 December the RG crew will be heading outside of our Marrickville Warehouse and setting up a reuse outdoor sale area outside the Greening Australia Hut at The Addison Road Community Centre! Come along and enjoy the Sunday Markets and grab yourself a bargain on discounted furniture, home decorations, 50 cent books, DVDs, CDs, vinyl and videos – and more! Plus get a free gift with every purchase!